This morning, I sprayed the top of the stab with one coat of satin clear Klass Kote and brought it in and sat it on the model room work table for 24 hour drying as shown below. One point I want to make is that very little if any overspray got on the top of the stab from when the bottom was sprayed yesterday. This will also be the case for the wing as well. An awfully lot of thought was put into how to hold the wing for spraying. The final solution came out unbelievably simple as shown below. 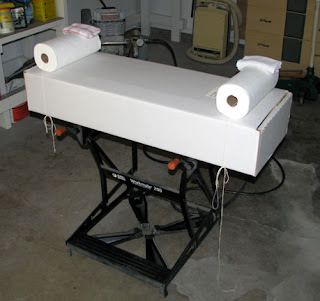 Two fresh rolls of Viva paper towels were tied across each end of a long box with string as shown below. 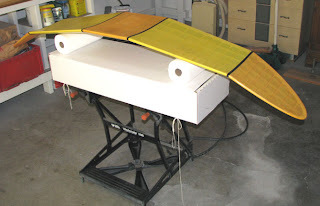 A folded rag was placed on top and at the end of each roll for trailing edge shims also shown below. 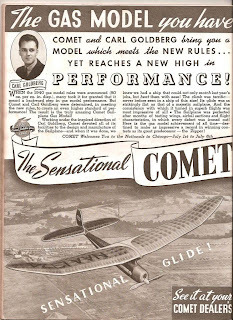 The Sailplane's wing was place upside down onto the rolls. The wing was gently pushed down into the rolls to form a kind of depression for a pseudo cradle as shown below. Then the air supply was attached to the empty spray gun and mock spraying was done to see if the wing was going to move under the spray gun's air pressure. The wing was as solid and did not move or rock at all. 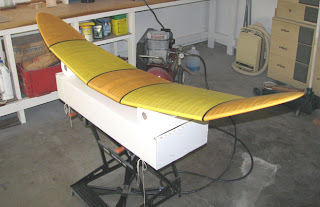 Then the wing was turned over and placed onto the rolls without the two rags on the end as shown below. Again the air supply was attached to the empty spray gun and a mock spraying was done to the top of the wing to see if it was going to move under the spray gun's air pressure. Again the wing was as solid as rock and did not move at all in the upright position.